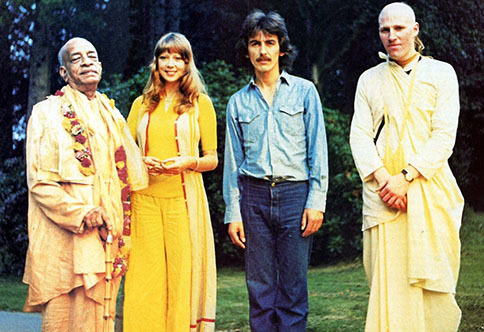 George Harrison talks of Srila Prabhupada, spiritual food, and the books of the Hare Krishna movement. Last September 4 George Harrison got together with his long-time friend Mukunda Goswami, a leader of the Hare Krsna movement, and discussed Krsna consciousness at length. In the first part of their talk, published in our January issue, George told of some striking experiences he's had while chanting the Hare Krsna mantra and revealed some of his realizations about the chanting and the philosophy of Krsna consciousness. This month the interview concludes with George telling how he feels about having helped the devotees expand the movement in England, how he relishes prasadam (sanctified food), and how he deeply appreciates the movement's founder, Srila Prabhupada. George: The first time I met Syamasundara, I liked him. He was my pal. I knew that Syamasundara and all of you were in my age group, and that the only difference, really, was that you'd already joined and I hadn't. I was in a rock band, but I didn't have any fear, because I had seen dhotis, your robes, and the saffron color and shaved heads in India. Krsna consciousness was especially good for me because I didn't get the feeling that I'd have to shave my head, move into a temple, and do it full time. So it was a spiritual thing that just fit in with my life-style. I could still be a musician, but I just changed my consciousness, that's all. Actually, it gives me pleasure, the idea that I was fortunate enough to be able to help at that time. All those songs with spiritual themes were like little plugs, "My Sweet Lord" and the others. And now I know that people are much more respectful and accepting when it comes to seeing the devotees in the streets and all that. It's no longer like something that's coming from left field. And I've given a lot of Prabhupada's books to many people, and whether I ever hear from them again or not, it's good to know that they've gotten them, and if they read them, their lives may be changed. Mukunda: When you come across people who are spiritually inclined but don't have much knowledge, what kind of advice do you give them? George: I try to tell them my little bit, what my experience is, and give them a choice of things to read and a choice of places to go like you know, "Go to the temple, try chanting." Mukunda: In the "Ballad of John and Yoko," John and Yoko rapped the media for the way it can foster a false image of you and perpetuate it. It's taken a lot of time and effort to get them to understand that we are a genuine religion, with scriptures that predate the New Testament by three thousand years. George: The media is to blame for everything, for all the misconceptions about the movement, but in a sense it didn't really matter if they said something good or bad, because Krsna consciousness always seemed to transcend that barrier anyway. The fact that the media was letting people know about Krsna was good in itself. Mukunda: Srila Prabhupada always trained us to stick to our principles. He said that the worst thing we could ever do would be to make some sort of compromise or to dilute the philosophy for the sake of cheap popularity. Although many swamis andyogis had come from India to the West, Srila Prabhupada was the only one with the purity and devotion to establish India's ancient Krsna conscious philosophy around the world on its own terms not watered down, but as it is. George: That's right. He was a perfect example of what he preached. Mukunda: How did you feel about financing the first printing of the Krsna book and writing the introduction? George: I just felt like it was part of my job, you know. Wherever I go in the world, when I see devotees I always say "Hare Krsna!" to them, and they're always pleased to see me. It's a nice relationship. Whether they really know me personally or not, they feel they know me. And they do, really. Mukunda: At lunch today we spoke a little about prasadam, vegetarian foods that have been spiritualized by being offered to Krsna in the temple. A lot of people have come to Krsna consciousness through prasadam, especially through our Sunday Feast at all of our temples around the world, I mean, this process is the only kind of yoga that you can actually practice by eating. George: Well, we should try to see God in everything, so it helps so much having the food to taste. Let's face it, if God is in everything, why shouldn't you taste Him when you eat? I think that prasadam is a very important thing. Krsna is God, so He's absolute: His name. His form, prasadam, it's all Him. They say the way to a man's heart is through his stomach, so if you can get to a man's spirit soul by eating, and it works, why not do it? There's nothing better than having been chanting and dancing, or just sitting and talking philosophy, and then suddenly the devotees bring out the prasadam. It's a blessing from Krsna, and it's spiritually important. The idea is that prasadam's the sacrament the Christians talk about, only instead of being just a wafer, it's a whole feast, really, and the taste is so nice it's out of this world. It's undoubtedly done a great deal toward getting a lot more people involved in spiritual life. Prasadam breaks down prejudices, too, because the) think, "Oh, well, yes, I wouldn't mind a drink of whatever or a bite of that." Then they ask, "What's this?" and "Oh, well, it's prasadam." And they get to learn another aspect of Krsna consciousness. Then they say, "It actually tastes quite nice. Have you got another plateful?" I've seen that happen with lots of people, especially older people I've seen at your temples. Maybe they were a little prejudiced, but the next thing you know, they're in love with prasadam, and eventually they walk out of the temple thinking, "They're not so bad after all." Mukunda: The Vedic literatures reveal that prasadam conveys spiritual realization, just as chanting docs. You make spiritual advancement just by eating it. George: I'd say from my experience that it definitely works. I've always enjoyed prasadam much more when I've been at the temple, or when I've actually been sitting with Prabhupada, than when somebody's brought it to me. Sometimes you can sit there with prasadam and find that three or four hours have gone by and you didn't even know it. Prasadam really helped me a lot, because you start to realize "Now I'm tasting Krsna." You're conscious suddenly of another aspect of God, understanding that He's this little samosa. * [**A cauliflower-and-pea-filled pastry deep-fried in clarified butter.] It's all just a matter of tuning into the spiritual, and prasadam's a very real part of it all. Mukunda: We've served about 150 million plates of prasadam so far at the free feasts around the world, what to speak of our restaurants. George: You ought to have it up outside on billboards like those hamburger places do. You know, like "150 million served." I think it's great. It's a pity you don't have restaurants or temples on all the main streets of every little town and village like those hamburger and fried chicken places. You should put them out of business. Mukunda: You've been to our London restaurant. Healthy, Wealthy, and Wise? George: Lots of times. It's good to have these and other restaurants around, where plainclothes devotees serve the food. People slowly realize, "This is one of the best places I've been." and they keep coming back. Then maybe they pick up a little bit of the literature or a pamphlet there and say, "Oh, hey, that was run by the Hare Krsnas." I think there's a lot of value also to that kind of more subtle approach. Healthy, Wealthy, and Wise has proper foods, good, balanced stuff, and it's fresh. Even more important, it's made with an attitude of devotion, which means a lot. When you know someone has begrudgingly cooked something, it doesn't taste as nice as when someone has done it to try and please God, to offer it to Him first. Just that in itself makes all the food taste so much nicer. Mukunda: You've been a vegetarian for years, George. Have you had any difficulties maintaining it? George: No. Actually, I wised up and made sure I had dal bean soup or something every day. Actually, lentils are one of the cheapest things, but they give you A-1 protein. People are simply screwing up when they go out and buy beefsteak, which is killing them with cancer and heart troubles. The stuff costs a fortune too. You could feed a thousand people with lentil soup for the cost of half a dozen filets. Does that make sense? Mukunda: George, you and John Lennon met Srila Prabhupada together when he stayed at John's home, in September of 1969. George: Yes, but when I met him at first, I underestimated him. I didn't realize it then, but I see now that because of him, the mantra has spread so far in the last sixteen years, more than it had in the last five centuries. Now that's pretty amazing, because he was getting older and older, yet he was writing his books all the time. I realized later on that he was much more incredible than what you could see on the surface. George: The thing that always stays is his saying, "I am the servant of the servant of the servant." I like that. A lot of people say, "I'm it. I'm the divine incarnation. I'm here, and let me hip you." You know what I mean? But Prabhupada was never like that. I liked Prabhupada's humbleness. I always liked his humility and his simplicity. The servant of the servant of the servant is really what it is, you know. None of us are God just His servants. He just made me feel so comfortable. I always felt very relaxed with him, and I felt more like a friend. I felt that he was a good friend. Even though he was at the time seventy-nine years old, working practically all through the night, day after day, with very little sleep, he still didn't come through to me as though he was a very highly educated intellectual being, because he had a sort of childlike simplicity. Which is great, fantastic. Even though he was the greatest Sanskrit scholar and saint, I appreciated the fact that he never made me feel uncomfortable. In fact, he always went out of his way to make me feel comfortable. I always thought of him as sort of a lovely friend, really, and now he's still a lovely friend. Mukunda: In one of his hooks, Prabhupada said your sincere service was better than some people who'd delved more deeply into Krsna consciousness but could not maintain that level of commitment. How did you feel about this? George: Very wonderful, really. I mean it really gave me hope, because as they say, even one moment in the company of a divine person, Krsna's pure devotee, can help a tremendous amount. And if I didn't get feedback from Prabhupada on my songs about Krsna or the philosophy, I'd get it from the devotees. That's all the encouragement I needed, really. It just seemed that anything spiritual I did, either through songs, or helping with publishing the books, or whatever, really pleased him. The song I wrote, "Living in the Material World," as I wrote in I, Me, Mine, was influenced by Srila Prabhupada. He's the one who explained to me how we're not these physical bodies. We just happen to be in them. That was the thing about Prabhupada, you see. He didn't just talk about loving Krsna and getting out of this place, but he was the perfect example. He talked about always chanting, and he was always chanting. I think that that in itself was perhaps the most encouraging thing for me. It was enough to make me try harder, to be just a little bit better. He was a perfect example of everything he preached. And it's still escalating even now at an incredible rate. It will go on and on from the knowledge he gave. It can only grow and grow. The more people wake up spiritually, the more they'll begin to realize the depth of what Prabhupada was saying how much he gave. Mukunda: Did you know that complete sets of Srila Prabhupada's books are in all the major colleges and universities in the world, including Harvard, Yale, Princeton, Oxford, Cambridge, and the Sorbonne? George: They should be! His contribution has obviously been enormous from the literary point of view, because he's brought the Supreme Person, Krsna, more into focus. A lot of scholars and writers know the Bhagavad-gita, but only on an intellectual level. Even when they write, "Krsna said . . . ," they don't do it with the bhakti or love required. That's the secret, you know Krsna is actually a person who is the Lord and who will also appear there in that book when there is that love, that bhakti. You can't understand the first thing about God unless you love Him. These big so-called Vedic scholars they don't love Krsna, so they can't understand Him and give Him to us. But Prabhupada was different. Mukunda: The Vedic literatures predict that after the advent of Lord Caitanya five hundred years ago, there would be a Golden Age of ten thousand years, when the chanting of the holy names of God would completely nullify all the degradations of the modern age, and real spiritual peace would come to this planet. George: Well, Prabhupada's definitely affected the world in an absolute way. What he was giving us was the highest literature, the highest knowledge. I mean there just isn't anything higher. Mukunda: A lot of people, when they just get started in spiritual life, worship God as impersonal. What's the difference between worshiping Krsna, or God, in His personal form and worshiping His impersonal nature as energy or light? George: It's like the difference between hanging out with a computer or hanging out with a person. Like I said earlier, "If there is a God, I want to see Him," not only His energy or His light, but Him. George: Each individual has to burn out his own karma and escape from the chains of maya, * [*The illusory energy that forces the pure soul to think that he is a material body and thus become entangled in material life.] reincarnation, and all that. The best thing anyone can give to humanity is God consciousness. Then you can really give them something. But first you have to concentrate on your own spiritual advancement; so in a sense we have to become selfish to become selfless. George: Life is like a piece of string with a lot of knots tied in it. The knots are the karma you're born with from all your past lives, and the object of human life is to try and undo all these knots. That's what chanting and meditation in God consciousness can do. Otherwise you simply tie another ten knots each time you try to undo one knot. That's how karma works. I mean, we're now the results of our past actions, and in the future we'll be the results of the actions we're performing now. A little understanding of "As you sow, so shall you reap" is important, because then you can't blame the condition you're in on anyone else. You know that it's by your own actions that you're able to get more in a mess or out of one. It's your own actions that relieve or bind you. Mukunda: I don't think it's possible to calculate just how many people were turned on to Krsna consciousness by your song "My Sweet Lord." Why did you feel that you wanted to put Hare Krsna on the album at all? Wouldn't "Hallelujah" alone have been good enough? George: Well, first of all "Hallelujah" is a joyous expression the Christians have, but "Hare Krsna" has a mystical side to it. It's more than just glorifying God; it's asking to become His servant. And because of the way the mantra is put together, with the mystical spiritual energy contained in those syllables, it's much closer to God than the way Christianity currently seems to be representing Him. Although Christ in my mind is an absolute yogi I think many Christian teachers today are misrepresenting Christ. They're supposed to be representing Jesus, but they're not doing it very well. They're letting him down very badly, and that's a big turn-off. My idea in "My Sweet Lord," because it sounded like a "pop song," was to sneak up on them a bit. The point was to have the people not offended by "Hallelujah," and by the time it gets to "Hare Krsna," they're already hooked, and their foot's tapping, and they're already singing along "Hallelujah," to kind of lull them into a sense of false security. And then suddenly it turns into "Hare Krsna." and they will be singing that before they know what's happened, and they will think. "Hey, I thought I wasn't supposed to like Hare Krsna!" Mukunda: What would you say is the difference between the Christian view of God, and Krsna as represented in the Bhagavad-gita? George: When I first came to this house it was occupied by nuns. I brought in this poster of Visnu [a four-armed form of Krsna]. You just see His head and shoulders and His four arms holding a conch-shell and various other symbols, and it has a bigom† [† This transcendental syllable, which represents Krsna, has been chanted by many persons throughout history for spiritual perfection.] written above it. He has a nice aura around Him. I left it by the fireplace and went out into the garden. When we came back in the house, they all pounced on me, saying, "Who is that? What is that?" as if it were some pagan god. So I said, "Well, it God is unlimited, then He can appear in any form, whichever way He likes to appear. That's one way. He's called Visnu." It sort of freaked them out a bit, but the point is, why should God be limited? Even if you get Him as Krsna, He is not limited to that picture of Krsna. He can be the baby form. He can be Govinda and manifest in so many other well-known forms. You can see Krsna as a little boy, which is how I like to see Krsna. It's a joyful relationship. But there's this morbid side to the way many represent Christianity today, where you don't smile, because it's too serious, and you can't expect to see God that kind of stuff. If there is God, we must see Him, and I don't believe in the idea you find in most churches, where they say, "No, you're not going to see Him. He's way up above you. Just believe what we tell you and shut up." Mukunda: Anyone who's sincere about making spiritual advancement can usually see the value of chanting, whatever his religion may be. I mean if that person was really trying to be God conscious and trying to chant sincerely. George: That's right. It's a matter of being open. Anyone who's open can do it. You just have to be open and not prejudiced. You just have to try it. There's no loss, you know. But the "intellectuals" will always have problems, because they always need to "know." They're often the most spiritually bankrupt people, because they never let go; they don't understand the meaning of "transcending the intellect." But an ordinary person's more willing to say, "Okay. Let me try it and see if it works." Chanting Hare Krsna can make a person a better Christian, too. Mukunda: When you were in Vrndavana, India, where Lord Krsna appeared, and you saw thousands of people chanting Hare Krsna, did it strengthen your faith in the idea of chanting to see a whole city living Hare Krsna? George: Yeah, it fortifies you. It definitely helps. It's fantastic to be in a place where the whole town is doing it. And I also had the idea that they were all knocked out at the idea of seeing some white person chanting on beads. Vrndavana is one of the holiest cities in India. Everyone, everywhere, chants Hare Krsna. It was my most fantastic experience. Mukunda: You wrote in your book: "Most of the world is fooling about, especially the people who think they control the world and the community. The presidents, the politicians, the military, etc., are all jerking about, acting as if they are Lord over their own domains. That's basically Problem One on the planet." George: That's right. Unless you're doing some kind of God conscious thing and you know that He's the one who's really in charge, you're just building up a lot of karma and not really helping yourself or anybody else. There's a point in me where it's beyond sad, seeing the state of the world today. It's so screwed up. It's terrible, and it will be getting worse and worse. More concrete everywhere, more pollution, more radioactivity. There's no wilderness left, no pure air. They're chopping the forests down. They're polluting all the oceans. In one sense, I'm pessimistic about the future of the planet. These big guys don't realize that for everything they do, there's a reaction. You have to pay. That's karma. Mukunda: Do you think there's any hope? George: Yes. One by one, everybody's got to escape maya. Everybody has to burn out his karma and escape reincarnation and all that. Stop thinking that if Britain or America or Russia or the West or whatever becomes superior, then we'll beat them, and then we'll all have a rest and live happily ever after. That doesn't work. The best thing you can give is God consciousness. Manifest your own divinity first. The truth is there. It's right within us all. Understand what you are. If people would just wake up to what's real, there would be no misery in the world. I guess chanting's a pretty good place to start. Mukunda: Thanks so much, George. George: All right. Hare Krsna!